Droughts do not know borders or continents: they can occur across the world, in countries as different South Africa and Ukraine. The impacts however, differ greatly between communal farming systems, which can be found in South Africa, and large-scale agricultural enterprises that exist in countries such as Ukraine. Nevertheless, despite their differences, both countries need to report to the Sendai Framework for Disaster Risk Reduction (SFDRR), an international agreement by the UN in 2015 which sets common standards and targets for UN member states in disaster risk reduction. Countries are obliged to report things such as how many people are affected by drought, and what the direct economic losses due to drought are. But because drought can look different across the world, many governments find it difficult to determine the exact point in time when a drought should be declared and when to activate safety nets to help the most vulnerable. 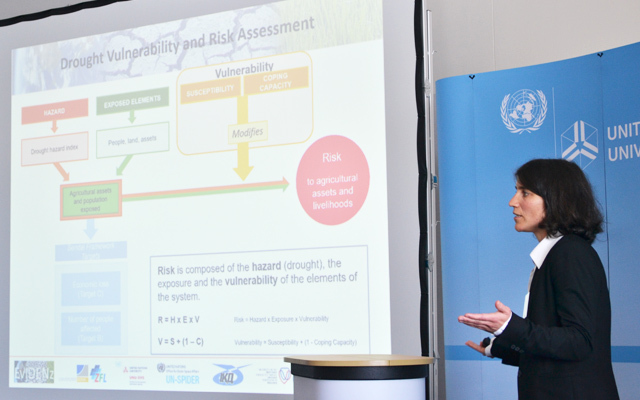 From 21st – 22nd September 2017, the United Nations University – Institute for Environment and Human Security (UNU-EHS) hosted the third stakeholder workshop of the EvIDENz project (Earth observation-based information products for drought risk on a national basis) to discuss these topics and mid-term project results with partners from the target countries of South Africa and Ukraine, which were chosen for their different farming systems. The workshop was also attended by experts from Germany, for example from the Federal Office of Civil Protection and Disaster Assistance (BBK), the German development cooperation (GIZ), and UN organizations, such as the United Nations Office for Disaster Risk Reduction (UNISDR), United Nations Framework Convention on Climate Change (UNFCCC) and the United Nations Convention to Combat Desertification (UNCCD). All partners exchanged results and insights from the past year. The discussions revealed the importance of a common understanding and definition of key terms such as “damaged” or “affected” in relation to identifying thresholds. Participants also highlighted the importance of sharing knowledge not only vertically – from the local to the global scale – but also between different disciplines and sectors, a major objective of EvIDENz. For further information, please visit the EvIDENz project page.